If you want excellent quality outdoor signs, talk to us first. We lead the whole of Western Australia WA when it comes to printing work. 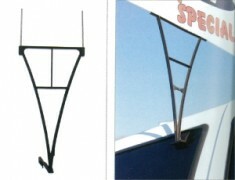 Outdoor display tools must be very creative and done to the highest quality to attract the masses. They should communicate the most essential details about your company in the most eloquent and brief manner. We have many options to choose from: Banner wall, roll up banners, telescopic, pop up, A Frame and X Frame. Feel free to speak to Western Australia WA printing for special consultation on all our outdoor signs. Regarding roll up banners, we produce two different types. 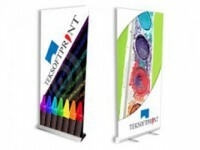 These are perfect for those of you who do outdoor marketing campaigns and corporate events. Our roll ups are eight hundred and fifty millimetres wide and two thousand and ninety millimetres high. They are silver anodised, free standing and decorated with high quality colour graphic. Roster signs are another type of outdoor sign made by Western Australia WA printing. These are high quality yet low priced advertising tools. Protected from bad weather, our roster signs are lightweight, portable and flexible marketing instruments. They are printed on both sides and are easily folded into a triangular shape. Sold inexpensively, our high-quality roster signs are perfect for cost-effective promotions. If you are interested in having product and/or service promotions that stand out, pick our one way vision films. These are made with a PVC vinyl substrate that protects them from bad weather elements. Hence, our one way vision films are durable and ideal for indoor or outdoor use. These can be fixed on the rear window of your vehicle or be applied on the outside of your glass windows. They are self-adhesive and can be attached to the area of your desire. There are no better one way films in Western Australia WA than the ones we create here. Western Australia WA printing also offers top-quality A Frames for marketing. These are extremely strong, durable and affordable. As well they are waterproof, guaranteeing that nothing will succumb to extreme weather conditions. Just like the roster signs, these outdoor signs are printed on both sides and in full colour. They are attractive even from a distance and are free-standing, metal frames. They can be used in numbers, if you wish, when the message being conveyed must reach many people within a short period. Since they are foldable, our A Frames are easy to store. And if you need to change the Corflute, it is extremely easy. To spread the word about your business even much more quickly and creatively, choose our banners. These are perfect for outdoor marketing campaigns and we produce many different types. We can customize your banner if you opt not to choose a premade one. To get started, choose among our shop signs, banner signs, banner flags, truck curtains, fence mesh or tautline truck sides. 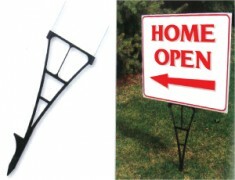 For a promotional tool to slide onto a truck window or vehicle window, choose our home open signs with a window clip. Our Home Open Signs are more preferable because of their low costs and ability to match different business types. Mostly we sell it to realtors who have houses to advertise. Usually printed on both sides, these signs have a Corflute size of 35 millimetres by fifty millimetres. Also ask us for Eco-flex signs, acrylic signs and car magnet promotional products. We have everything you need. Made from colorless, durable and weather-resistant material they are the perfect substitution for heavy glass signs. Turn your car into a moving promotion without permanently damaging it with our high quality car magnets that can be easy stuck on and taken off. Our eco-flex signs are the perfect promotional product for all your marketing needs. Eco-flex signs are wind-resistant, weather resistant, versatile and cost effective way of promoting your business. This is the perfect option for when you donâ€™t have grass or loose sand available for traditional home open signs. They can be placed on widows in houses, offices or cars to boost you company. Our spider stake is light weight and made of heavy duty plastic so it can withstand winds without falling over. Our signs are printed 2 sided to boost your visibility with a gloss finish. Enhance your brand with WA PRINTING banners, printed on PVC heavy duty material they are weather and water resistant to ensure they last. An affordable but effective solutions for your business these signs are light weight and weather resistant. For high quality one way vision films you need to contact WA PRINITNG. With prominent characteristics like low cost, flexibility, waterproof, and lightweight, roster signs are and affordable and economical solutions for advertisement. Affordable but versatile solution for business marketing.